Benefits of chromium for controlling diabetes have been scientifically established. Signs of chromium deficiency are insulin resistance and poor blood sugar control. Thus chromium supplements can be beneficial. It has been scientifically established that chromium supplements can have a positive effect on diabetes by improving blood sugar control. Just how chromium does this was not widely known until recent research uncovered the role of chromium in regulating blood sugar levels. It has been known for over 50 years that signs of chromium deficiency include high blood sugar and complications of pre-diabetes. It is estimate that up to 50% of the American population may be chromium deficient! Is it any wonder that diabetes is statistically on the rise? The benefits of chromium provide another example of how the simple addition of certain foods, or chromium supplements can have a positive effect on one of the most serious health issues of our time, diabetes. In the past chromium toxicity was felt to be a problem with chromium supplements, however the form of chromium used in these supplements is different than what is used in industry so the issue of chromium toxicity does not present a problem in a properly formulated supplement. Cells use an internalized communication system we refer to as cell signaling. This intracellular signaling process is involved in regulating glucose absorption at the cellular level. Chromium is needed at the cellular level for these processes to be properly completed. GLUT4 is a vital glucose “transporter molecule” that is activated by chromium. This activation allows glucose to flow into the cell, lowering glucose concentrations in your blood. This is how chromium promotes better blood sugar control. Chromium requirements expressed as the ESADDI (estimated safe and adequate daily dietary intake) in adults for chromium is 50-200 mcg. It is best to get this from food sources if possible, but sometimes chromium supplements can be helpful in certain situations. Benefits of Chromium – Which Supplements? 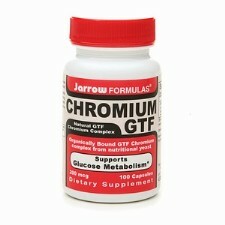 Chromium supplements come in several forms. As chromium polynicotinate, chromium picolinate, and GTF chromium. The FDA actually allows a qualified health claim for chromium picolinate as research has shown that this form helps lower blood sugar. Recent research at Georgetown University Medical Center, Department of Physiology, tested 6 chromium supplements for their efficacy in increasing insulin sensitivity. Only three compounds: chromium chelavite (amino acid-chelated), chromium polynicotinate, and chromium picolinate, actually enhanced insulin sensitivity. If you use a chromium supplement, seek the guidance of an antiaging physician or clinical nutritionist, for recommendations on the best chromium formulation and dosage, for your individual needs. As for brands, I am partial to Jarrow Formulas, Life Extension, Pure Encapsulations, and Poliquin Performance. These brands always deliver top quality! Benefits of chromium for the management of blood sugar make it one of the most critical nutrients for good health. Diabetes and pre-diabetes is one of the most significant health problems of our time, and chromium is a vital nutrient for getting this under control. Just as vitamin-d deficiency is widespread and linked to many chronic diseases, symptoms of chromium deficiency are widespread and also linked with significant health problems. Getting more chromium into your diet though foods or chromium supplements should be a priority.